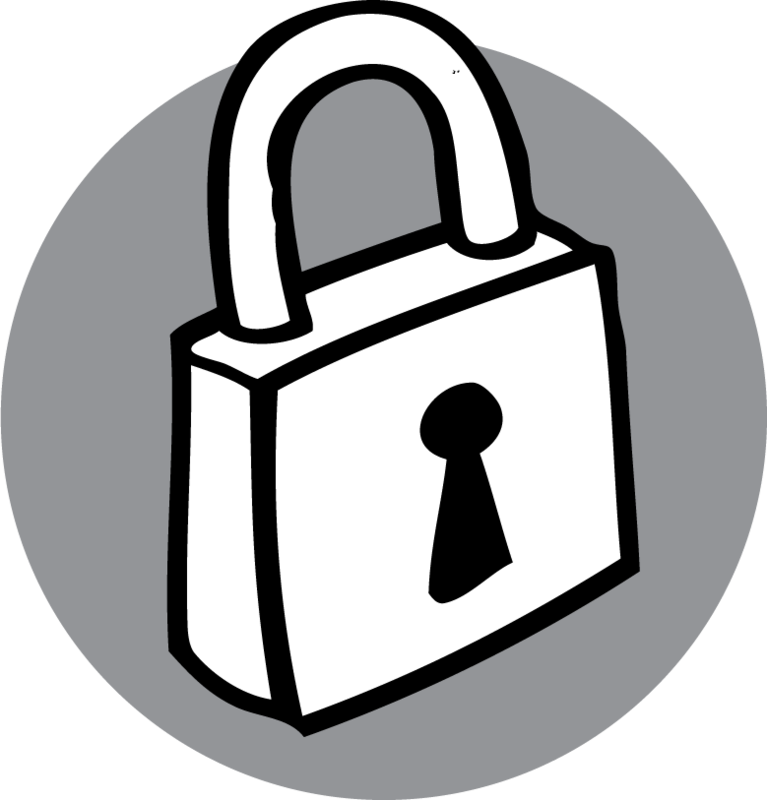 A user’s security level controls what they can see and do while signed in to iCarol. There are five basic security settings you can assign to any user, ranking from least capabilities to most they are: Trainee, Standard, Enhanced, Supervisor, and Admin. In addition to this overall security setting, there are many different Advanced Security Settings that you can enable for an individual user that allow for more customization for that particular user’s capabilities. When Admin users first sign in to iCarol, they see a unique dashboard. This dashboard shows information that is mainly useful just to those who have this highest security permission, such as access to the iCarol User Community for networking and communication with other Admins worldwide, and invoicing and subscription information, for example. One feature of that unique dashboard is the ability to see details on the current version of iCarol being used, and information about past and future releases and what functions those releases include. This is information that is helpful to all users, both non-Admin and Admin alike, so starting with our next release, tentatively scheduled to occur on April 4th, non-Admin users will see information about release history and future release plans on their own dashboard when they sign in. This will help educate and inform users about the release process and will prepare users for visible changes they may notice in their systems. By providing this information directly we hope it will reduce the number of inquiries Admin users will receive from their staff and volunteers who are assigned lower security levels. In fact, in many centers there are very few people with an Admin setting, and in some instances of large networks, there may be no Admin users on site at a particular organization location. We hope that by having access to this information, all of your users will be better informed about the iCarol system they are using and what changes they might expect to see, simultaneously reducing the need for Admin users to field questions about these changes. If you have any questions about this change, please contact our Support Team by opening a case. 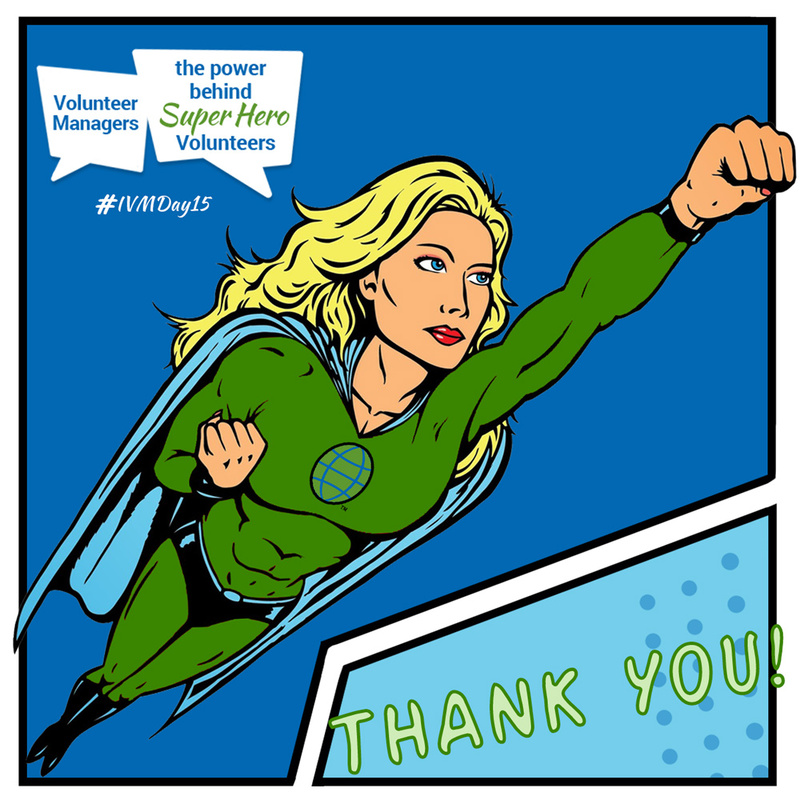 November 5th is International Volunteer Managers Day! Kudos to all you amazing Volunteer Managers out there. You do everything from recruitment to training to supporting and event planning. Check out a great blog by Volunteer Canada and infographic that goes over the 15 Roles that Volunteer Managers play. Your helpline couldn’t run without your great work bringing the talent and time of volunteers to your agency. On behalf of everyone here at iCarol, thank you for what you do! September is considered the peak of hurricane season in the Atlantic, but disaster can strike all year ’round and in all regions. Earthquakes, wildfires, blizzards, tornados, floods, super storms – all areas have seen their share of destructive events. Non-profit helplines play a large role in any community’s disaster plan. Local governments often partner with these helplines and advertise their contact information during disasters as a place to contact for non-emergency information and referral. 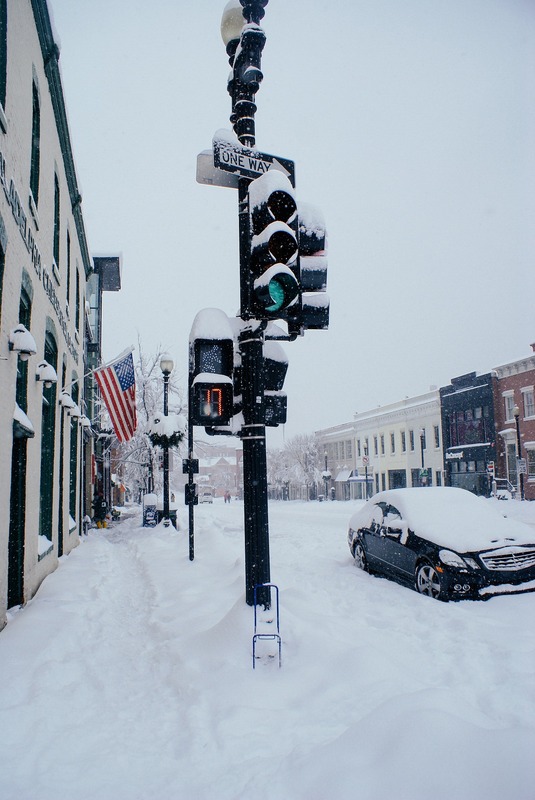 Information about shelters, emergency food or water drops, road closures, and shelter-in-place tips, are just a few examples of the information that these helplines can relay to the public in a local emergency. The availability of such services in times of disaster is crucial – they serve as a way for residents to get much needed information and listening support, while also reducing the burden on local government and diverting non-emergency calls away from 9-1-1. Providing this service presents unique challenges to helpline staff, but iCarol offers a number of solutions to reduce the stress of being there for your community during emergencies. During a disaster helplines in a region often need to work together to coordinate response. Some disasters may force one or more local helplines to close entirely, or at a minimum a helpline may be short staffed. Using iCarol you can easily share responsibility for managing call/text/chat volume and resource maintenance by using our collaborative options. We’ve discussed in previous posts how you can build chat or text networks using iCarol, and such a collaboration would come in extra handy if your center needs to shut down or simply offload some traffic during a disaster. And most phone systems allow for the easy transfer or forwarding of calls. 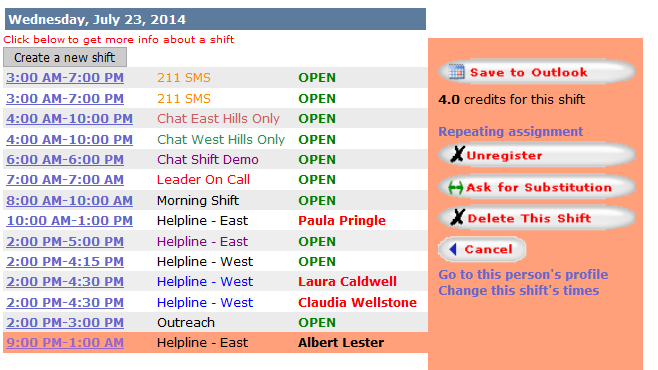 With Call Report sharing capabilities, forms used by one center can be set up for use by another helpline in the event calls, texts, or chats are being routed elsewhere. By setting up these shared forms, the original call center can be certain that the center answering calls is filling out all the necessary information and collecting the essential data as if the call was being handled by the original center. You’ll still be able to review the forms and collect statistics on those calls handled by your partner. 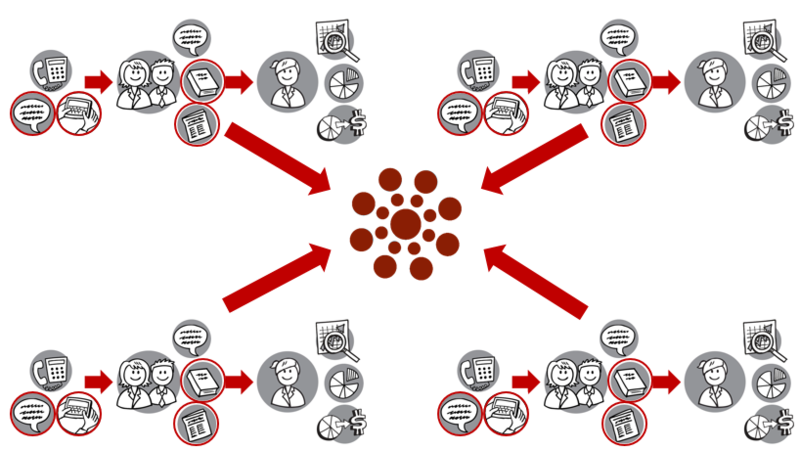 Collaboration is not just limited to call reporting forms, however. Helplines can also share a database of community referrals and resources with other helplines so that in the event of an emergency, these helplines can access resources not just in their own community, but elsewhere in the region. Further, helplines can partner together to not only access this database to give referrals to help seeker, but can also share in the responsibility of editing these resources. In the event of a disaster, helplines will likely have specific data they wish to collect on those disaster-related calls, as well as needing a way to separate those calls, chats, or texts from others that may ring through to the center. It’s also very common for local governmental and other agencies to request this data from the helplines so they can monitor the needs of the community and respond accordingly for this and future events. 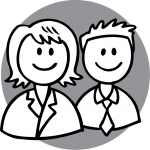 The key to collecting data in iCarol is found within the customizable report forms you fill out for each client interaction. 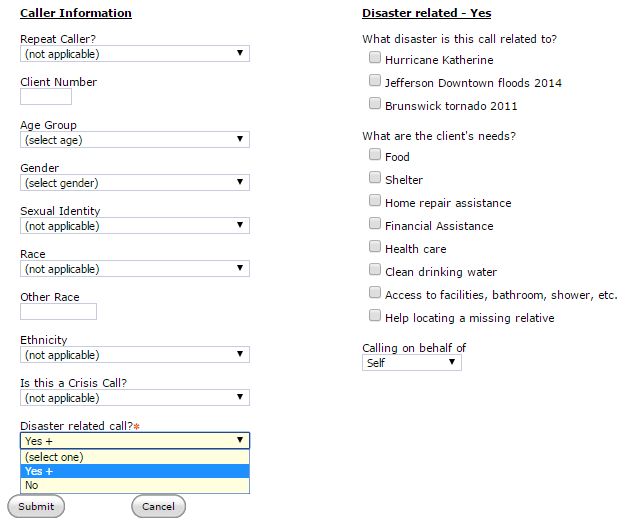 Using the robust form editing tools, staff can add necessary questions and other fields for data collection when needed, so as soon as the disaster-related calls come in they are ready to collect the necessary information on the form. Staff can also use this capability to create a simple checkbox where call takers can note that the call was related to the disaster event, which will help identify these calls during statistical reporting later. When it’s time to report on the helpline’s calls, staff can run various spreadsheets, reports, and charts. 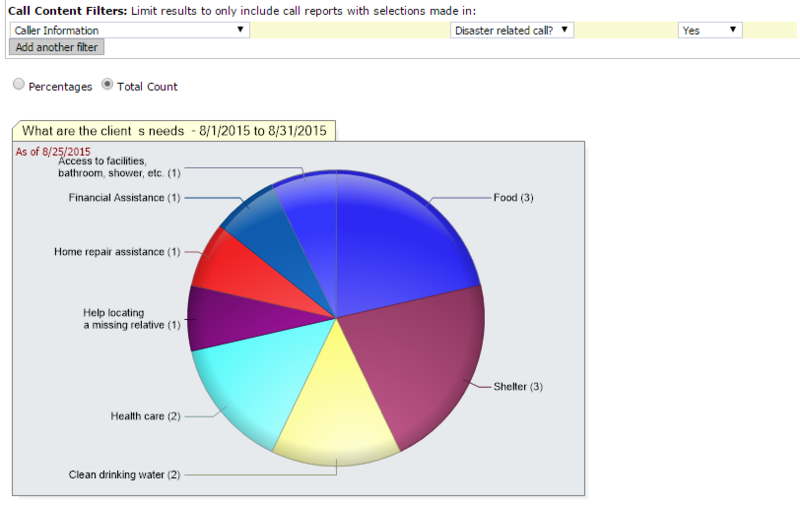 Results are available in real-time and can be filtered based on whether or not the call was related to the disaster, making it easy to run reports specific to the event, excluding unrelated calls. Offering alternative channels becomes especially important during a disaster. Phone lines may be down or it may be easier for people in need to text you during these trying times. Plus the mobility of texting means that someone can reach out to you from anywhere, even if they’ve been displaced from their home. With iCarol you have complete control over when your messaging service is available, so you can very quickly create a shift and open up your channels as needed. You could even have a special portal specifically for disaster that has its own special report form that collects all the necessary information. And remember with Messaging you can offer all the same referrals and run the same statistical reports as you would for phone calls. An emergency in your community means your volume could increase, so reaching your volunteers and staff is important. 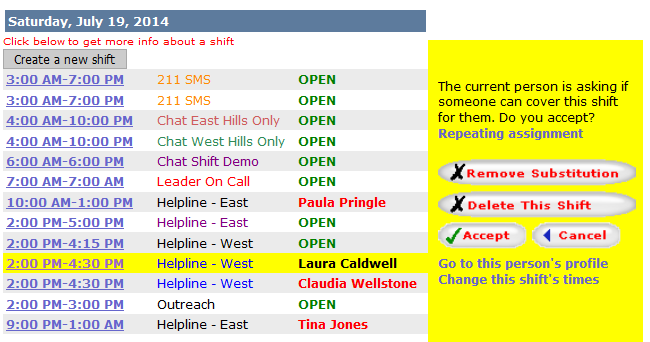 Inside iCarol you can promptly send out an email blast or mass text to alert your staff and volunteers of information they need to know, or ask for additional staffing. 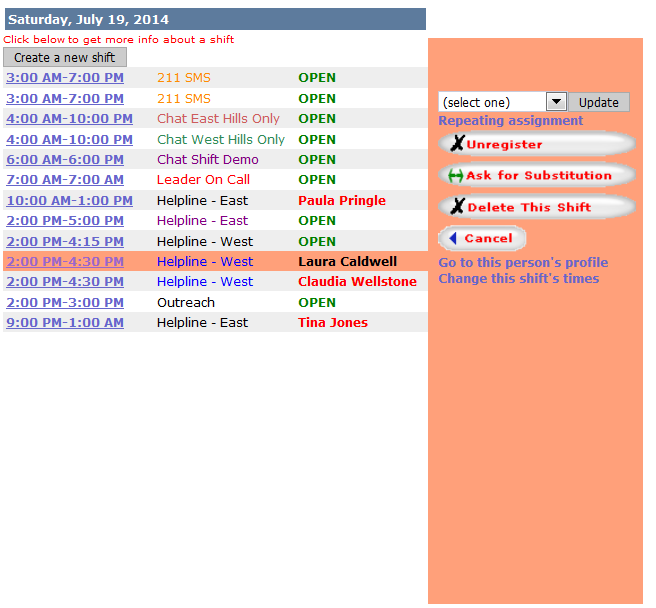 Quickly adjust your shift calendar to accommodate more open spots and assign your workers to shifts on the fly. 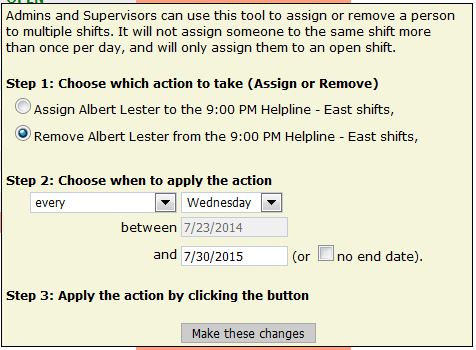 If you’d like to specifically track disaster staffing, consider creating new shifts and naming them accordingly for easy reporting. Analyze the hours worked for use in future planning, or to apply for future grants or compensation that may be offered by local governments and other organizations. iCarol can be reached from any internet connected device, so you could explore work-from-home options for disaster staffing. You may wish to temporarily turn off any restrictions in place for which computers can access iCarol, or grant certain staff the ability to certify their home computers. During any sort of emergency, information could develop rapidly and change throughout the event. As your resource managers receive information from the various community agencies or collect information released by your local government, they can respond quickly. 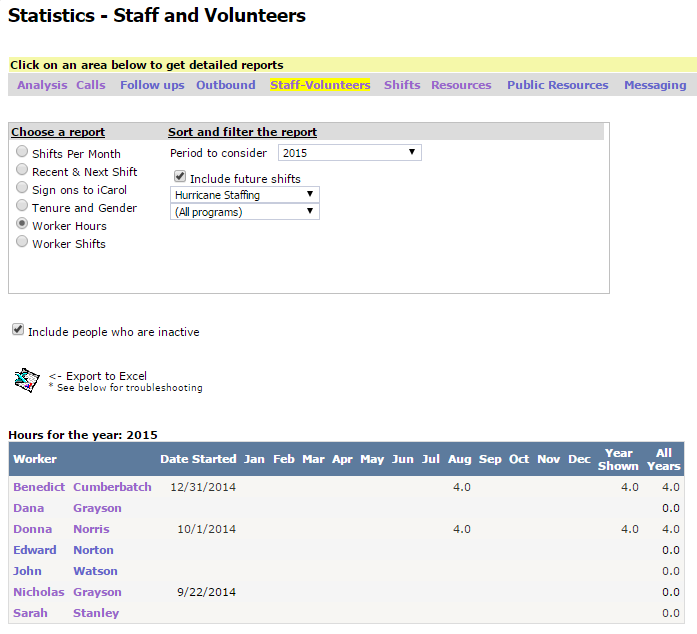 Update resource records accordingly, or create new ones with just a few clicks. Use the iCarol News area to post the most up-to-date information; it’ll be front and center when your volunteers first sign on so they won’t miss the latest updates. Much like we mentioned earlier with alternative channels, a disaster could mean that even more people are seeking information in alternative ways. Help seekers likely want self-service options to find resources. This is where your Public Resource Directory comes in. Visitors to your website can use an embedded search of your live resource database right on your website to find what they need. Our API is another option for referral sharing, giving you and your developers access to your resource data so it can be used in whatever ways you see fit, such as creating a home built web directory, mobile apps, and more. Providing assistance to your community during a disaster is a lot of work, but having so many time-saving tools integrated in your helpline software will take some of the stress out of the event, and your seamless response will prove that your helpline is an invaluable resource in your community. And even if your center doesn’t use iCarol, I hope this blog has sparked some ideas for how your helpline can plan ahead and more easily provide services when your community needs it most. Our clients spoke and we listened! Many clients expressed a wish for iCarol to be able to leverage text messaging in new and different ways. Therefore, we added three new ways to use text messaging in iCarol. This article will outline how to send text notifications and text messages to other users in your iCarol system, and a future article will outline how to conduct follow-ups via text message. These new options carry no set-up fee, but you will be charged a monthly fee for the text messages sent, at a rate of $40/1000 messages/month. 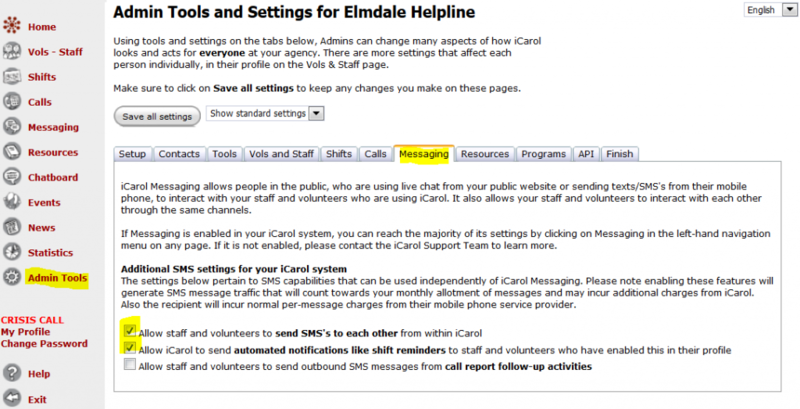 The new SMS options will first need to be turned on by an Admin in your iCarol system. They can be found by clicking Admin Tools in the left hand menu, and then the “Messaging” tab. Doing so will take you to the page pictured below, where you will want to click the box next to the first two options to place a check mark there, then click the “Save all settings” button at the top of the screen. Those individuals who would like to be able to receive SMS messages from other users or would like to receive notifications via SMS will need to edit their user profiles to include a mobile phone number, and to give permission for SMS messages to be sent to them. To do so, the user, or an Admin on their behalf, will click Vols-Staff in the left hand menu, then click on the name of the person whose profile they would like to edit. Next, click the Contacts tab, the click the Edit button at the top of the screen. Next, enter a phone number into the Mobile Phone field, and click the box next to “I permit SMS’s to be sent to this mobile phone” to place a check mark there. Finally, click the Save button at the top of the screen. Please note the text in red. SMS messages from iCarol may be sent at any time. It is suggested that if you would not like to receive SMS messages during certain time frames, you explore your mobile phone options to determine if there is a setting you can use to delay delivery of SMS messages to certain time frames. Most mobile phones have this option so that, for example, it can be set so that SMS messages are not delivered between the hours of 11pm and 9am. Any message that might have been sent during that time frame is not delivered until after 9am. Alternately, most mobile phones also allow users to set their phone to silent, so that the notification sound that usually plays when a phone call or text message is received is not heard. Once the option to send SMS notifications is turned on, additional options are displayed on the Notifications tab of user profiles as below. Each individual, or an Admin on their behalf, can edit these options to indicate which notifications they would like sent via SMS. 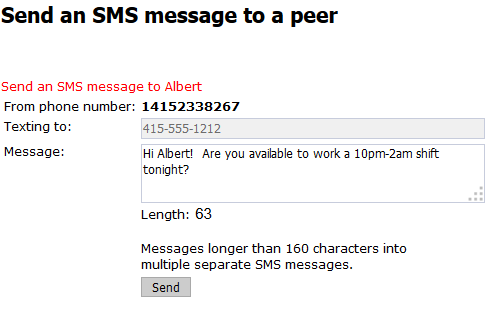 To send a SMS message to another user, follow the steps below. 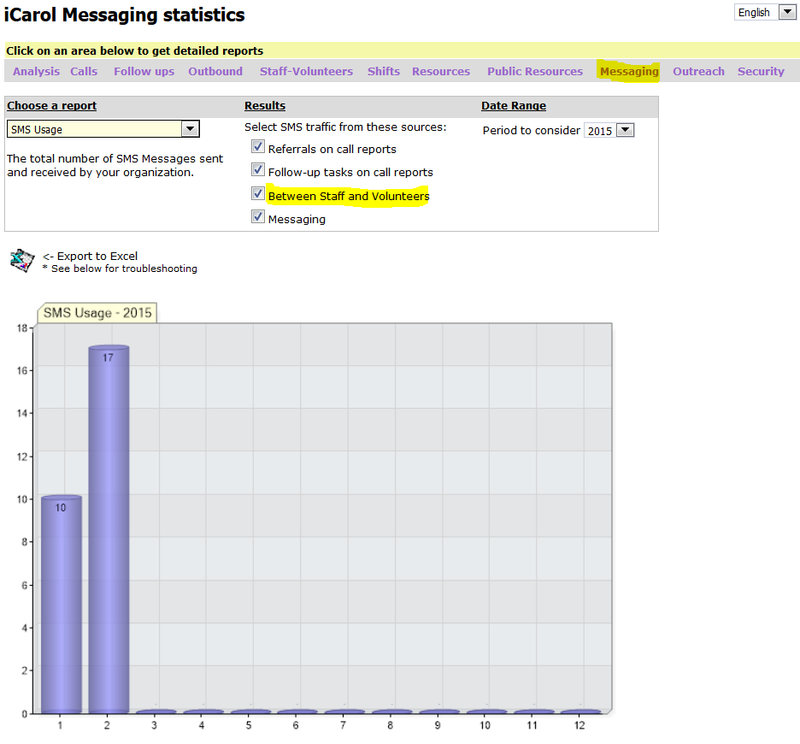 A new report has been added to the Statistics page of iCarol to help you track how many SMS messages are being sent from your system. 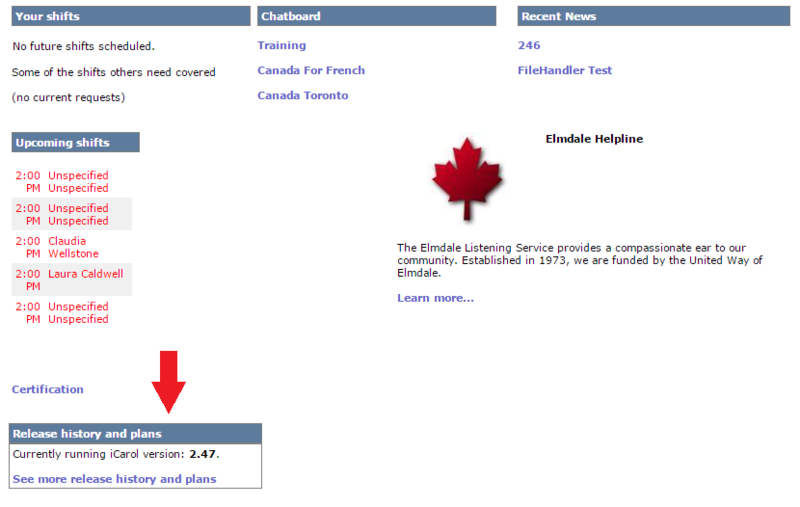 Admins can access this report by clicking Statistics in the left hand menu, then the Messaging menu. 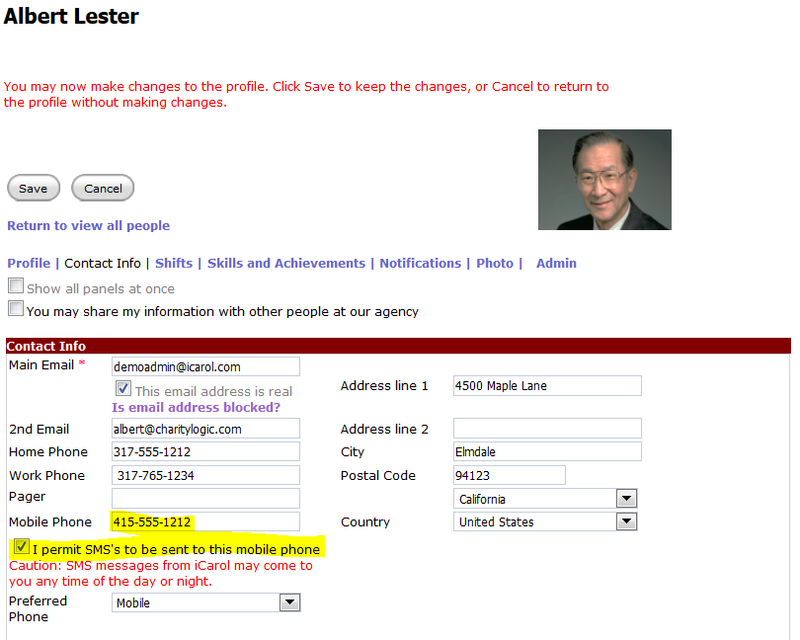 This report contains several filters so you can determine from what area of iCarol the SMS messages are being sent. 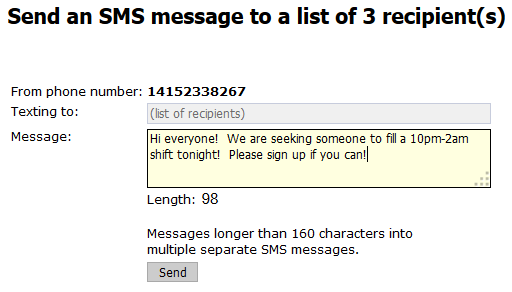 “Between Staff and Volunteers” is the option to choose if you would like to see how many notification messages and messages between users are being sent. If you have any questions or need any clarification on this functionality, please do not hesitate to send a case to iCarol Support!